Canary house on La Palma, the green and beautiful Canary Island. A well-groomed driveway with parking for several cars leads to the main house. On this property at 480m above sea level. with a plot of 2700m², with stunning views of the countryside, the sea and Tenerife, as well as La Gomera you can reach the conservatory via a huge terrace. This is used as a dining room. The villa is equipped with Wi-Fi, flat screen TV and German satellite TV, a wood burning stove, two double beds, a loft bed and a travel cot. It has a separate kitchen with microwave, oven, stove and fridge-freezer. From the bedroom you get directly to the bathroom with washing machine. Other equipment: sun loungers, covered barbecue area, bed linen and towels. Around the house are cozy places to relax as well as a well-preserved "Era" as additional terrace offers magnificent views. It offered direct flights from many German airports. VERY CHEAP Flights also from Amsterdam (Transavia) !!! From 20 rental days or z. For example, for wintering, we will gladly make you an individual offer. Suitable for allergy sufferers, no pets. Please contact us a call with any questions about La Palma, the house, the car hire, travel planning, what to do, etc. We know our way to La Palma and look forward to your email or call! You can reach us by e-mail ((or call / WhattsApp under 0172-9113916, 0162-9459017 or 05904-960760. Distinctive, relaxing country house with an amazing terrace! Four of us, parents and two daughters (12 and 14), had a great stay at this charming, rustic yet very comfortable house with a fantastic terrace that we are all missing now that we are back in northern Europe. The house is well located for driving to any other part of the island, and within easy driving distance for fabulous beaches in the south near Fuencaliente. There are two bedrooms within the house itself, although one doubles as a living room/bedroom with a comfortable double bed. The master bedroom also has a comfortable double bed, and a bunk-bed suitable for children. The bathroom is very well appointed, contemporary and clean. The kitchen offers all we needed for great breakfasts and some evening meals, all eaten on the beautiful terrace. 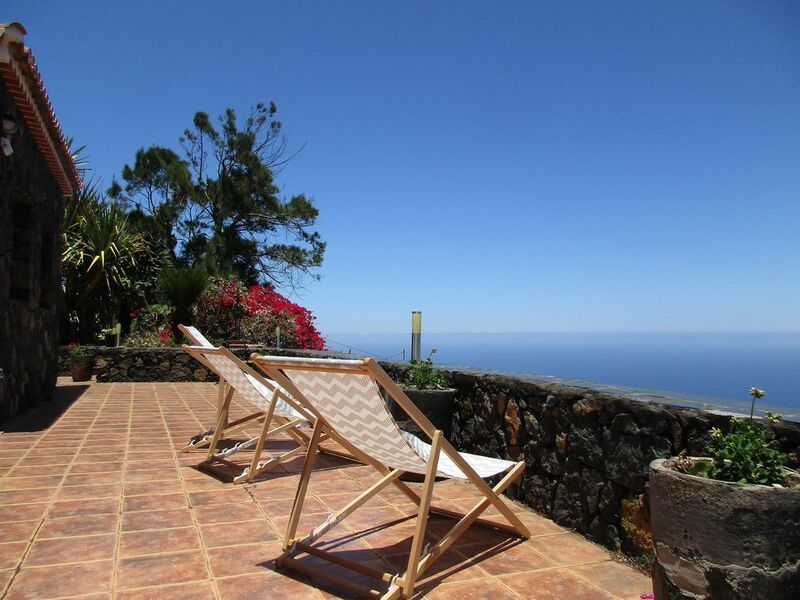 It has everything you need for an amazing stay in La Palma! Die Aussicht auf das Meer, sowie nach Teneriffa und Gomera sind toll, ebenso ist der nächtliche Sternenhimmel ein Genuss. Der Vermieter ist sehr bemüht um das Wohl seiner Gäste, kümmert sich vorausschauend darum - z.B. Holznachschub für den Kamin. Die Räumlichkeiten sind großzügig ausgelegt. Wir haben dort eine tolle Woche bei bestem Wetter verbracht. Die Lage war für uns perfekt, die Sicht von der Terrasse ebenso, es fehlte uns an nichts, wirklich ein wunderbares Haus. Wir waren kurz vor Weihnachten hier und es hat uns sehr gefallen. Die Unterkunft war wie erhofft sehr ruhig gelegen. Alles war sauber und wirklich liebevoll eingerichtet. Für uns war sie ein guter Ausgangspunkt um die Insel zu erkunden.